I’ve been doing lots of exercises to strengthen my feet and ankles (theraband exercises, calf raises, “short foot“). Today I added in exercises with a small rubber ball, sliding it back forth under my foot from each toe to heel, then curling and uncurling my toes around it, then moving it side to side. But now, ouch. It felt pretty good while I was doing it, but now my left foot is a bit sore. Still, I think it’s a positive sign that I’m getting more mobility in my foot now. I’ve noticed lately that my left foot is also getting more muscle tone. Plus it actually looks straighter than it did. I used to think that my left foot was slightly smaller than my right, but now I’m realizing that it was actually underdeveloped and twisted so that it didn’t quite point straight ahead. Now I’m happy to say that the left foot seems to be catching up in size as well as strength. Feet are so important to skating, but we tend to forget about them since they are encased in those thick boots. We forget that they are armed with sharp steel! Today on my lesson I was doing back progressives, and Laurie noticed that I don’t always have as much of my foot down on the ice as I should. Having more blade on the ice immediately made everything feel more stable. This makes sense. Not only does it keep me from rocking towards the ball of my foot and back (allowing my hips to go back and forth) but it also gives me more of a “feel” for the ice. This in turns makes it easier to control my edges with foot and ankle pressure rather than by swinging my upper body around. inside to inside edges: do not transfer weight in that awkward way that you’ve been doing, please; practice dragging the free toe to get a sense of the correct position; make sure you turn out at the knee. Viennese Waltz mohawk: don’t overdo the ronde de jambe idea; the free foot (right) passes through close to the left, and only then makes a little circle at the top. Then the right foot is drawn in with a little extra action (as in the ballet frappé). Viennese Waltz back progressive “run” and change edge: do not rotate upper body out of circle; create edge with ankles instead. Make sure you maintain that last back outside edge around the same circle (this will be easier if you don’t yank the back progressive around). Then draw foot in close and parallel in order to accentuate this back edge before the change edge and cross. In honor of my little rubber ball, here’s a song from 1966, “Red Rubber Ball,” which went to #2 on the Billboard Hot 100 chart. It was co-written by Paul Simon of Simon and Garfunkel and Bruce Woodley of The Seekers and was sung by The Cyrkle (the bass guitarist and one of the lead singers Tom Dawes later became a jingle writer and did the memorable “Plop plop fizz fizz” song for Alka-Seltzer). But you didn’t really need to know that; it’s the optimistic attitude that matters. Only I’ve got a green ball, so . . . . And what’s with that starfish anyhow? Categories: basic skills, compulsory ice dances, ouch! and how to fix it, skating music | Tags: adult figure skating, adult skating | Permalink. So at my lesson today Laurie noticed that I was not following through on setting my foot and ankle down on a good edge. I am good at faking this, clearly; I even fooled myself into thinking that I was doing edges. Here was my ruse: I would put down my skate at what looked like a good angle, but then as soon as I would push, my ankle would give way and my foot would wind up on a flat rather than surging forward onto a brave new edge. I didn’t realize I was doing this. Holding my ankle and foot strong into the edge made things much better. After I was off the ice, I tried this strong position off the ice. But I will have to keep at this; my left ankle and foot are much weaker than my right ones, and I have to really think about this action in order to do it consistently on both sides. We are working on making my forwards and backwards progressives run-worthy in preparation for the “run” in the Viennese Waltz. Here’s the instructional video that explains the dance. You will notice that the progressives are quick (one beat for each edge) and light. This means that the edges have to take off right away. Having stronger ankle and foot action will hopefully also allow for better knee action and better free leg extension. One thing that has been driving Laurie insane is my sloppy free leg, which tends to relax at the knee joint (even doing a little kick if I am not mindful). This problem is easier to deal with if I have a stronger edge and a deeper knee bend; driving the new skating foot forward allows for a force that offsets the extension backwards. Some time ago, I wrote a post on oppositional tension; this would apply here. Ari used to describe this as the feeling of pulling your skating leg and free leg away from each other. Hopefully this will help me get away from plodding across the ice so cautiously. The goal is to make it look like these progressives are skipping across the ice. So today I set out to make what I thought was an easy round of bittersweet chocolate pudding. I have made this recipe before; it is thickened with egg yolks rather than cornstarch, and is fairly easy to make on the stove. But alas, I ran short of cream and the milk-cream ratio was off. Then, because it wasn’t getting thick enough, I tried adding another egg yolk later. Big mistake. I had to strain the entire thing and it didn’t set correctly. So now I have a bowl of pudding that wobbles. It is still pretty irresistible, and I will have no trouble consuming it. As dessert, it does the job; after all, you can’t taste the wobble. But that wobble is there, reminding me of a time when I would set down my (usually left) skate and have no idea where it was going. Hopefully that scary memory as well as the wobble will retreat into the past soon. There’s something comforting about not being able to remember things (like bad dreams and where you put your keys and the fact that you were once terrified of left three turns). But in the meantime I am trying not to fixate on that little shimmy side to side once in a while. After all, it doesn’t affect me that much after the initial set-down of the edge. Trying to skate right through the wobble, rather than letting myself worry about it too much, is a new practice strategy. I’ve been putting a lot of effort into posture corrections on the local level, but I need to get myself moving again. Now that the new blades feel pretty good and my bruises are healing up (itchy stage, though, ack! ), I feel like I need to spend at least part of the time putting things back together again so I don’t look like a stop-action film in slow motion. This week I also read an article in the New York Times that talked about a study on running injuries. The study concluded that the impact of landing affected how many injuries female recreational runners suffered; not surprisingly, the ones who ran lightly on their feet, like insects running across the water, had fewer injuries than those that pounded along. I think the equivalent for skaters is that fluid, light, continuous motion that distributes force along each edge. I can’t demonstrate this without the wobbles getting in the way, but luckily there are internet videos aplenty to help illustrate the skating equivalent of the water strider. Yes, “Clair de Lune” has been used a lot for skating, but somehow I never get tired of it, especially when it’s used like this. So I tried my best “oh woe is me I have new blades and can’t really skate” excuse with Ari on my lesson today, and for a while it I thought it just might work. After all, I can be quite pitiful when I want to be. We started the lesson with some basic forward and back progressives in a circle. I felt pretty strong on the forward progressives, even with the inevitable adjustments: turn out the free foot more, sternum over the blade, make sure you are really on an edge. We worked on posture (drawing the upper body and head up to create space for the hips), bending the knee forward of the toe, articulating my ankles, and really leaning in the direction of the free foot. I suggested that we use the pole harness for back progressives, but Ari willfully assumed that I was just kidding so I had to just do them unassisted. Lots of adjustments needed here. I am not quite on the right part of the blade yet, especially on the left side. My weight tends to sneak up towards the balls of my feet, which makes me pitch forward. There are other things that would help these back progressives, like making sure my forward arm is lower than my back arm. Or allowing my new foot to contact the ice and then drawing it in underneath me before I transfer my weight, instead to just stepping down. OMG. It’s been a long time since the name of any compulsory dance has passed his lips during one of my lessons. Hearing that, I just went ahead and did an end pattern (though I’m always confused as to whether steps 5 -14 actually count as an end pattern). And since going through the motions of the Kilian has become my skating equivalent of doodling, the choctaw itself was not half bad. What needed major reforms were the steps leading into the choctaw. I have been doing something akin to contortionism on these edges. If you look at this video of Maya Usova doing choctaws, you’ll see these different positions in action. Steps 5- 7 (Maya 32-33 seconds in) progressive. Arms/torso in neutral. Step 8 (Maya 35) cross in front. Left arm in front and torso turned clockwise. Free foot comes in behind at what feels like an acute angle but is really parallel. Warning: Among other bad things, I have been letting my left hip open up and get stuck behind my right. To get in the correct position, I have to lift out of my hips, and feel as though my left hip is actually leading the circle, even though I am on my right outside edge. I also have to allow that right thigh to move inwards against the clockwise rotation of the torso–now that I know how to engage my adductors, this is less mystifying than it sounds. Step 9 (Maya 36) inside edge. The left inside edge is placed beside the right, not behind it; right foot slides out in front. Left arm is still in front and torso turned clockwise; belly button towards inside of circle. Of course, Ari wants this sequence in both directions: “Ice dancers do things in both directions” (nyah nyah nyah nyah). So it’s time to work on reverse Kilians, which I have tried before. This will be my secret weapon, at least in my dreams. The new blades have made this an exciting week. I am really jazzed to be working on steps of the Kilian again, as well as to get some insights into basics. One big thing to remember, which Ari underscored at the end of the lesson, is that I must get my weight on the correct part of the blade. This is really important, especially since on my new blades there are dire consequences for being on the wrong part of the blade. By dire consequences I don’t just mean annoying scratchy sounds or a slight bobble here and there. I mean the kind of ungainly maneuvering for balance. Even worse, it can lead to Pain. Not the psychic pain that can lead to an existential crisis (“Why ice dance? Even when you get better at it, you just keep going around in circles?”) I scoff at that kind of pain most of the time, except when I’m feeling particularly down in the dumps. But I mean actual Pain, as in the pain in my left knee and foot, which went beyond the merely annoying to the noteworthy and Advil-worthy phase this week. I haven’t had this kind of Pain in a while, so I attribute it to the new blades, which don’t let me get away with much. It may have been all that walking I did over the holidays as well. The knee pain is going away, but I am more concerned about the foot pain, which I worry might be a recurrence of my tendonosis/tendonitis. I wrote a post about this around a year ago, though I think I misidentified the affected tendon. I’m pretty sure have posterior tibial tendon dysfunction, which affects the tendon that runs from the calf to the bones of the inner foot. At any rate, I have been working on strengthening exercises for the foot as well as continuing to work on better alignment overall. Hopefully getting back on my blade will help this. Here’s a Beatles favorite to underscore this. Starting skating later in life, as I did, has its ups and downs. The ups are that I now have the means to do it, at least in terms of access to rinks and excellent coaches and a very supportive skating community. And I have lots and lots and lots of motivation, and nobody to fuss at me about how I’m spending my money and time. And I can drive myself to the rink. Ah, the joys of being a grownup! And my left three turn is now a thing of beauty (on a good day) and my knees still work okay. So I should just stop here before describing the downs, right? Never shy away from the dark side, I always say. Especially when it provides an opportunity for a quotation or two from Eric Franklin’s Dynamic Alignment Through Imagery. Towards the end of his book, Franklin takes on the idea of “pulling up” in dance or yoga, in which you try to maintain alignment by lifting the ribs, sucking in the abdomen, and tucking the buttocks under. The problem is that this desirable posture (“high chest” for dancers) is achieved through a constant activation of “voluntary control,” which leads to rigidity, poor breathing habits, and a lack of full spatial awareness. When I read this, I realized that this has been me all over. I have been achieving a degree of alignment in skating through being a control freak: muscling through my edges and turns, rather than figuring out how to skate in a more efficient way. According to Franklin, our emphasis should be on the proper conditioning (especially of the abdominals), placement, and technique to allow for “dynamic stability”: “the ability to maintain or to return to a position after a disturbance.” Skating is really “just” that: a series of dynamic positions. Our muscles work to absorb forces (up and down, forward and backwards, round and round), counter-balance (ankles press forward, free leg extends), and produce speed for the next position. Certain muscles deep in the core really help with more efficient stabilization. (Other books I’ve read stress this as well; for instance, Annemarie Autere has described these inner muscles in The Feeling Balletbody.) But until this past year I haven’t really been thinking about how to use those. Instead, I have been trying to shore up instabilities and perturbations in my positions through tightening other large external muscles. I have been trying to lift parts of myself, rather than just figuring out how to lean in, bend in, and sink in. It has been like trying to defy gravity, rather than thinking about it as something that could be beneficial. Guide this force up through your body (primarily through the bones). Liberated from their tasks of superfluous gripping, the muscles begin to create optimal alignment and lift. The nervous system becomes more alert, the reflexes more nimble. Freeing the muscles eliminates any controlled precipitation of weight down into the knees and feet. When you feel your weight, you gain control. Franklin mentions that certain alignment problems happen when older dancers have adopted “cool” postural habits that they then don’t feel that they have the time to change. This feels so true of some of the things I have been doing inefficiently. They seem to work so well–up to a point! But I realize that I have been working way too hard. And honestly, I’m too old for that. Plus I’m too old to waste any energy feeling sad about being too old to waste my energy. Ha! So the trick is not only to learn more efficient ways of doing things, but also to allow myself the mental time and space to let go of these former muscular habits. Here’s where “skating like a kid” comes in. I love watching those skinny little kids fly around the rink, doing their footwork and their twizzles and their triple what-nots. You can tell when they’ve figured out the proper technique; they just seem to float over their skates. There is minimal extra force generated by large muscle groups. Those tiny little bodies have so little muscle to begin with! So yesterday, I decided that I needed to do a skinny little Kilian pattern or two. Okay, this is just imagery; I missed the “skinny little kid” phase entirely. But it is possible to think about how skating would work if I were just a stick-like figure, rather than a supple and curved adult who can bend any which way (okay, that’s a fantasy too, but maybe closer to my twisted reality of late). Three things that I noticed. One is that the Kilian has become a compulsory that I just mess around with for fun. Wow. Two is that efficiency and laziness are connected; it takes relatively little energy to do the Kilian in this way, so I can then go off and see what my skating friends are up to. Three is that my alignment is much better overall. Hooray for that skinny little kid in all of us! Categories: compulsory ice dances, happy skating | Tags: adult figure skating, adult skating | Permalink. It’s interesting how perception plays a part in movement. I’ve been having a lot of trouble with the right outside to left outside closed mohawk. By “a lot,” I mean that the last time I had a lesson on it with Laurie, she didn’t even recognize what I was trying to do. Ack! This is the mohawk featured in the Silver Tango (also called the Harris Tango). It happens after the swing (which makes it a swing mohawk). This is a dance I passed years ago; in fact, it was the first silver compulsory dance I passed (and on the first try!). I passed it at the standard level, which meant I did it both solo and with a partner. Not only that, but it was one of the compulsory dances that I did in competition for two entire seasons. So I’ve had a lot of mileage on this turn. No, it’s a Zhulin. A right outside to left outside closed Zhulin. I’ve also had some success with another idea from Eric Franklin, whose awesome book Dynamic Alignment Through Imagery has been my bedtime reading for about a year (some things can’t be rushed). 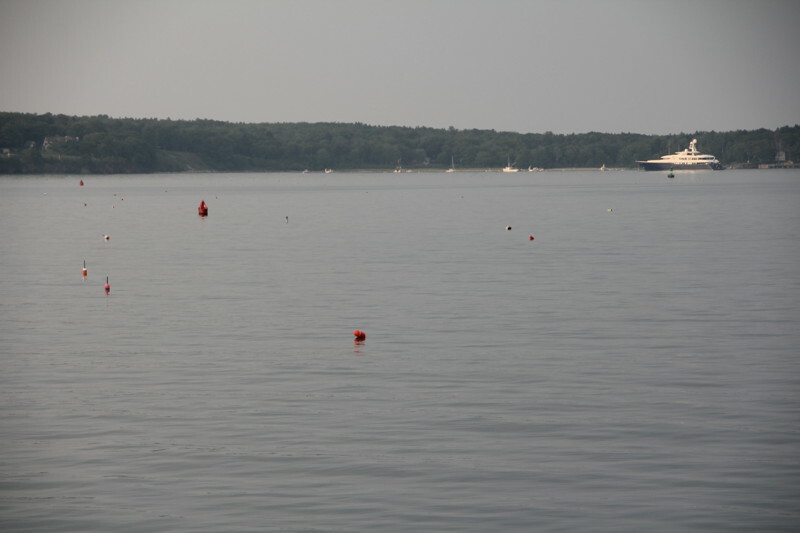 Franklin tells us to imagine the heads of our femurs as buoys floating on the water. As we bend and straighten our knees and ankles, or as the leg moves in the hip socket, the buoys move gently up and down in response to the level of the water. The important thing for me (Miss Misaligned) is that they stay at the same level in the water. Franklin suggests using this buoy idea for the head as well. The difference in using Franklin’s imagery, as opposed to simply saying “hips forward” or “head up,” is that it helps reinforce how movement is continuous and constant, rather than interrupted by sudden changes of position. It is also a positive rather than negative correction. Much better than telling myself not to be a bobbing bird. Plus it’s fun, being at the cold rink (getting colder, now that it’s September and fall weather is upon us) and imagining a warm summer day out on a boat or at the beach. The idea of floating in the water works for both gentle and more vigorous movement. 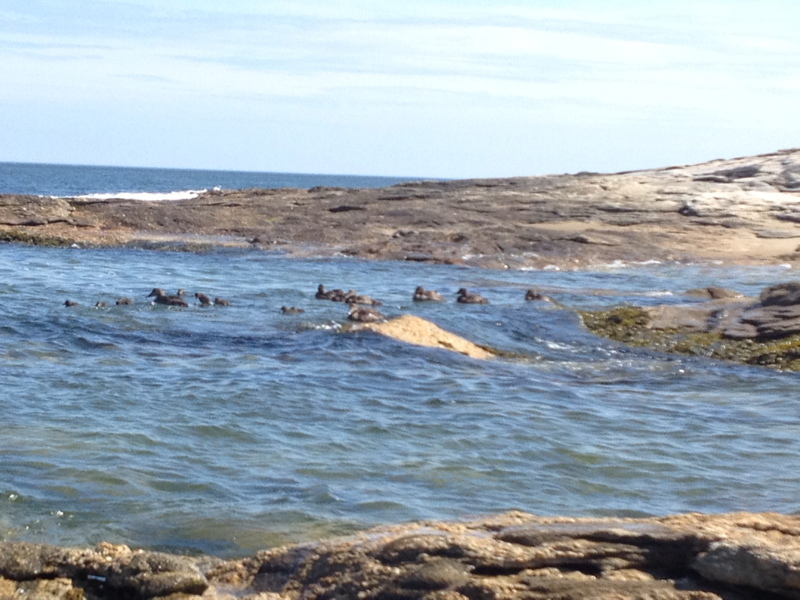 This past summer we saw several duck families hanging out by the rocky coastline of Reid Beach State Park in Maine. The waves were quite large for the little ducklings and they would get washed up and pushed down by the action of the water. A few of them would be submerged for a while, but they always popped up looking none the worse for wear. Ducks and ducklings at Reid Beach State Park (Maine). It’s a buoy! It’s a duck! No, it’s my femur! Floating through a Zhulin! Categories: basic skills, compulsory ice dances, happy skating | Tags: adult figure skating, adult skating | Permalink. Oh, so that’s how it goes! Now that there is a movement afoot to allow skaters to choose their own music for compulsory dances (hooray! ), I have been thinking about all kinds of possibilities. I am just starting to think about music for the Kilian. It’s a little fast (or maybe it’s just that my skating is a little slow) but I’m thinking maybe George Ezra’s “Budapest.” It’s upbeat, it’s steady, and it’s repetitive without being annoying. And it’s catchy as a song can be. The only issue is that it is hard to understand what the song is actually saying, as evidenced by this adorable video that shows schoolchildren trying to figure this song out. I’ve had some great lessons on it, and pored over the instructional videos. I’ve even (get this!) done this dance in competition (luckily, my partner lived). I think the basic issue had to do with my mistaken assumption that learning compulsory dances was all about executing a series of steps, rather than thinking about how one might use these steps to express something else. I can’t resist quoting the legendary Mr. Howard here, who says that the problem with many young musicians is that all they want to do is learn to play repertoire, when what they should be doing is learning to play the cello. Once you’ve done your homework trying to master technique, working on repertoire is like dessert. So I’ve been working hard on technique for a little over a year now, and now I’m ready for some dessert. This means giving some more time and energy to the compulsories again. The Kilian should be a good touchstone by which to judge whether my edge quality, body position, speed, lean, and flow have improved enough so that some expression (other than fear, dread, and loathing) is actually possible. My aim is not only to get through the Kilian, but to do the Kilian, “that light lively march.” (Next step is maybe to learn to ooze the Blues, but first things first). I want to be like the little girl at the end of that video who knows all about Budapest. And Hungary. Confident, eager, happy. Categories: compulsory ice dances | Tags: adult figure skating, adult skating, kilian | Permalink.